Lord Narasimha manifested Himself from a pillar and tore Hiranyakashipu into pieces. All the Devas were terrorised. Even Lakshmi felt grievous and left for Thiruvaali, a kshetra called Bilvaaranyam to do penance. She did not like the Lord in this fearful form. She was born in the Ahlada theertham there, created by Prahlada Himself. She was named Amruthavalli. She sincerely prayed to her Lord who appeared before her one day. The Lord embraced Amruthavalli. She spoke to him thus “ Oh Lord, isn’t it true that by your grace the poison turns into nectar, fire turns into sandalwood and water becomes land. Then why is it so that Hiranyakashipu remained an enemy to Prahlada all his life. Why didn’t you change his mind? Instead you chose to kill your devotee’s father , isn’t it an act of shame? For the welfare of the three worlds you killed that asura. But isn’t your devotee more important to you than the three worlds? You made your devotee fatherless. Thats the reason why I left you and came here.” The Lord smiled and consoled her “ My Dearest Laksmi, I had to kill Hiranyakashipu only because of the curse of the sanakadis. Prahlada Himself knew this. Hence he did not find fault with me. But I realise that you love Prahlada so fondly as to pinpoint my fault. I appreciate your vathsalya bhava towards Prahlada. But it is neither my fault, dear. Understand. 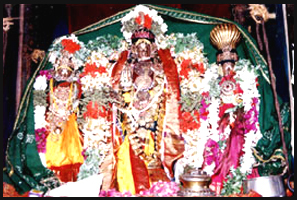 Lakshmi thus was pacified and Lakshmi Narasimha chose to bless all at ThiruvaaliThirunagari. Those who worship LakshmiNarasimha here are alaways rid of their sins. The birth place of Thirumangai azhwar and Kumudavalli, his wife. The Lord was robbed by Thirumangai mannan as a hunter when He came as a newly wedded couple. Hence the Lord here is Kalyana Ranganathar. Subsequently the hunter became azhwar. There is a separate sannidhi for this azhwar here.